According to Wikipedia, the telephone is one of the most “common appliances in the developed world.” The ubiquitous device was developed by Alexander Graham Bell in the mid-1870s, and he surely could not have predicted that it would play a major role in cult films and classic television, mainly in the horror genre. But that’s exactly what’s happened to the telephone, which -- along with the television set -- was recently selected as the next household “appliance” to become obsolete, specifically meaning land lines, I suppose. In cult-tv history, the telephone has been a critical ingredient in many stories. In the opening narration to the episode “Bad Connection,” Ghost Story/Circle of Fear (1972) host Sebastian Cabot (as Winston Essex) pontificated about the nature of the telephone, and how it allows us to “connect” to someone of our choosing. But what happens, Cabot asks, when someone “reaches” out to touch us, someone not of our choosing? That notion has been the core conceit of probably over a dozen programs in cult-tv history. 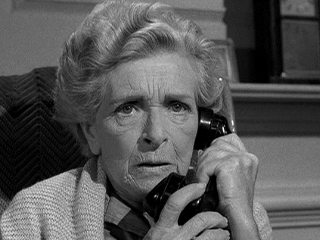 Rod Serling’s The Twilight Zone used the telephone as a major plot device in a number of its episodes. In “Long Distance Call (1961),” for instance, a dead grandma kept telephoning her grandson, played by Bill Mumy, trying to get him to join her on “the other side,” much to the dismay of his parents. And in “Night Call,” an old woman (Gladys Cooper) begins to receive strange phone calls in blackest night, only to learn (too late…) that the spooky caller is actually her dead husband, and that the phone lines have fallen onto his grave, thereby making a “connection” with the after life. The notorious Talky Tina also used the telephone to torment Telly Savalas in The Twilight Zone’s “Living Doll," and in the fifth season entry, “Ring-a-Ding Girl,” a phantom phone call from a possibly alternate universe changed the fate of many people in a small town, including actress Bunny Blake (Maggie McNamara). The aforementioned Ghost Story tale, “Bad Connection,” proved a variation on the “Night Call” format, only in this case, a secretary and widow portrayed by Karen Black was contacted from beyond the grave by her dead husband. In this case, the dead veteran used the phone – even when it was unplugged – to warn his wife that “death was coming” on the eve of her new marriage. 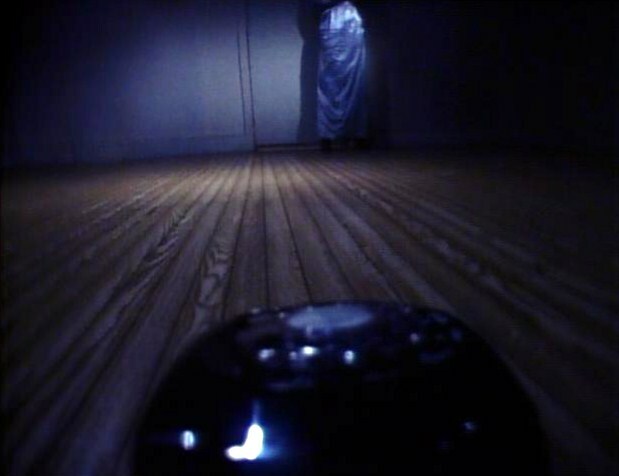 In the 1980s syndicated anthology, Tales from the Darkside, Jean Marsh was repeatedly hounded by a telephone from Hell in “Answer Me.” There, Marsh played a budding actress who needed her beauty sleep, but found it constantly interrupted by a ringing telephone in the next apartment. 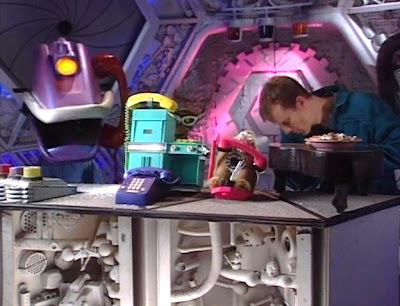 She finally found out that the phone itself seemed to be alive, and in one shocking (and giggle-provoking...) moment, the episode treated us to the telephone’s point of view as it raced across the floor and began choking the poor actress with its cord. In this case, the story focused on the idea that a modern convenience was actually a terrible inconvenience, a technological hassle and irritant. As late as 2004, the telephone was still being used as an entry-point into genre stories about “crossed wires.” In Smallville’s third season story, “Crisis,” Clark Kent (Tom Welling) receives a desperate phone call from Lana Lang (Kristin Kreuk), just as she is being murdered. Clark learns the phone call is not from the present, however, but the future, and must therefore prevent the murder from occurring. Over the years, various television programs not of a horror stripe have also been associated with the telephone. Everyone remembers the famous Batphone Commissioner Gordon (Neil Hamilton) always utilized to notify Batman (Adam West) any time a new criminal made his or her presence known in Gotham City. And the most famous gadget of Control Agent 86, Maxwell Smart (Don Adams) was surely his handy shoe telephone, on Get Smart. My personal favorite use of telephones in cult television history, however, comes from Mystery Science Theater 3000 in 1996. In one installment of the Comedy Central series, Mike and the Bots are forced to endure a very strange short film called Once Upon a Honeymoon (1956), which focuses, oddly, on the marketing of colored telephones (to blend in with kitschy 1950s décor...) After the movie is over, Mike, Gypsy, Crow and Servo stage their own version of the film using an ocelot phone (!) and an easy bake oven phone. It’s damn weird, but also a funny reminder that telephone have been a constant presence in our lives now for several generations. I fondly remember Bruce Willis phoning his doppelganger in Wes Craven's "Twilight Zone" episode 'Shatterday'.